As you get comfortable with pencil and paper, work on incorporating a technique or two that tells the viewer that this drawing was done by you, not one of the hundreds of other artists out there. Here are some tips on putting your own stamp on your art. The Great Masters of art have recognizable styles, and you need to have a distinctive style as well. You see the world with your own lenses and put your own spin on it — that uniqueness needs to come through in your artwork! You won’t do it as well as they do. You won’t have as much fun as you would creating your own style. Imitating someone else is harder than following your instincts. Loose leaves out lots of details and draws as few lines as possible; the viewer has to use her imagination and fill in the missing details. Tight is very detailed; the viewer has a better idea of what the illustrator or designer intended. Along with the loose versus tight rendering styles, illustrators find other ways to add their own signatures to their drawings. Some illustrators are very realistic with human details, and others let their imaginations run wild with poses and body parts that don’t really exist! After you find ways to make your drawings your own, continue to practice and work on your skills. Be open to taking classes or experimenting with different styles. Even after you develop a drawing style, you can continue to improve or change up your work. Remember, improving doesn’t mean your drawings aren’t good the way they are — there’s always room to develop your technique. Never stay satisfied with the status quo in your art, or your drawings will get stagnant as you draw things the same way every time. 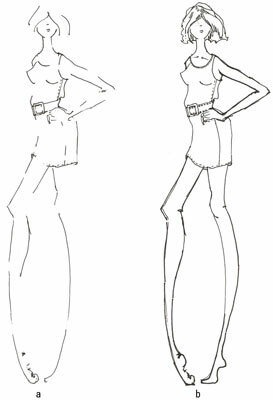 It’s one thing to develop a signature look and quite another to draw predictable work. Other ideas for branching out include getting inspiration from anything and everything you see, from still life to real life and everything in between! Look at the physical part of illustrating, too — experiment with other mediums, such as paint and digital design using a mouse or drafting tablet. Your techniques will always be your own, but they’ll evolve when you expose yourself to new ideas.